Jeep drive to Mustang Upper Mustang 2017 & 2018 organized by Nepal guide info team Jeep Safari for Adventure trip is a wonderful package designed by NGIT for the clients who love to have adventurous experiences in off-road Jeep drive to popular Upper Mustang restricted area with the views of natural beauty and local people during the tour, Nepalese and Tibetan cultures in Upper Mustang. Upper Mustang knows as little Tibet because Mustang people are influence by Tibetan people and follow the Tibetan cultures as well as Mustang Land is similar with Tibetan Land but now days there are flowing Nepali cultures to. 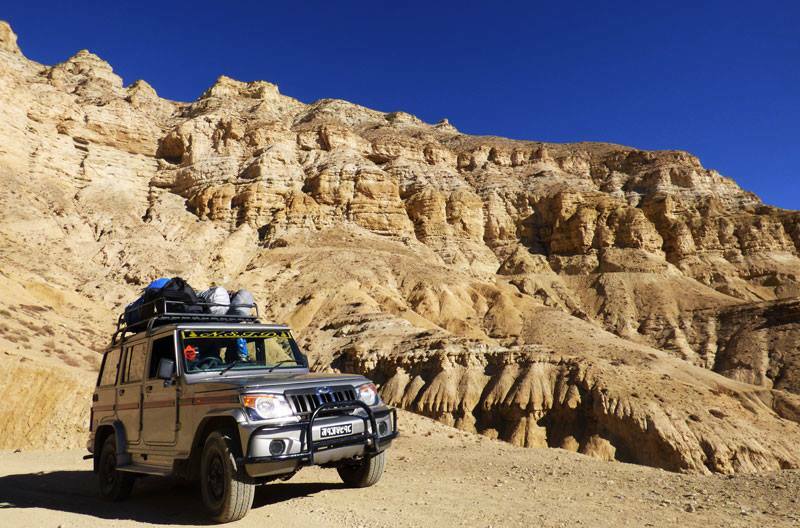 A 4wd jeep drive Adventure to Upper Mustang guided tour to the most stunning valleys of Mustang with spectacular mountain views and ethnic cultures of Nepal. We start with a ride to Pokhara – Nepal’s most chilled out lakeside city nestled in the laps of Annapurna mountain range and Dhaulagiri ranges. Day 03: Fly from Kathmandu to Pokhara (840m) and 30min Fly. Day 04: Jeep drive to Pokhara – Beni – Tatopani (2600m). Day 05: Jeep drive Tatopani to Kagbeni 2900m. Day 11: Drive back Chhuksang (2980m) to Kalopani (2530m). Day 12: Drive back Kalopani to Pokhara (840m). Day 13: Fly back to Kathmandu (1340m).